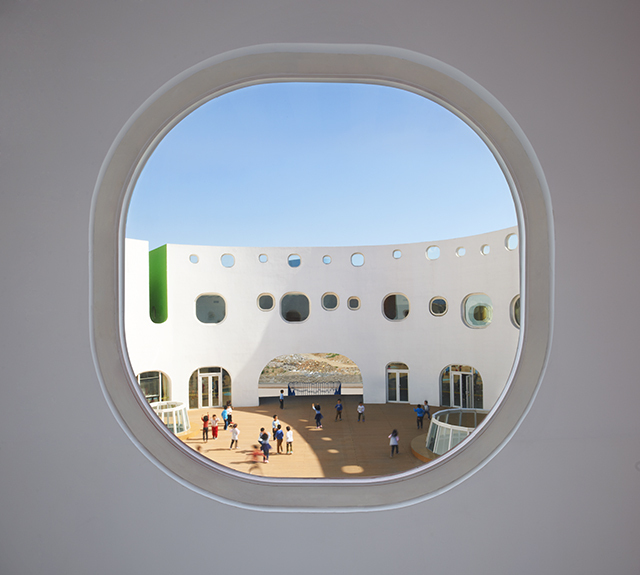 Sako Architects, is the person responsible for creating LOOP, a 45,000 square foot, color coordinated kindergarten school in Tianjin. Located in the fourth largest city in China, Tianjin is home to over 300 Fortune 500 companies. As business brings more international families into Tianjin, bilingual schools are at a high demand. LOOP is a chance for parents to completely immerse their children into a world of imaginative, interactive, and colorful learning methods in both Chinese and English. To create the unorthodox establishment, Sako, along with his team of architects, Yoko FUJII, Shuhei AOYAMA, and Junya KAZUNO went to work on dreaming up a place that has an element of freedom, somewhere where the children can experience joy while learning. The exterior shell of the white building is covered in rows of large airplane style windows, where the window sills are painted one of 7 different colors that represent a specific location. The bright selection of colors help the kids get around, it's much easier to get to the nurses office if you know to look out for the color red on the walls, floors and handrails of the balconies. The kindergarten is formed by curves, as the entire structure rounds into a loop. 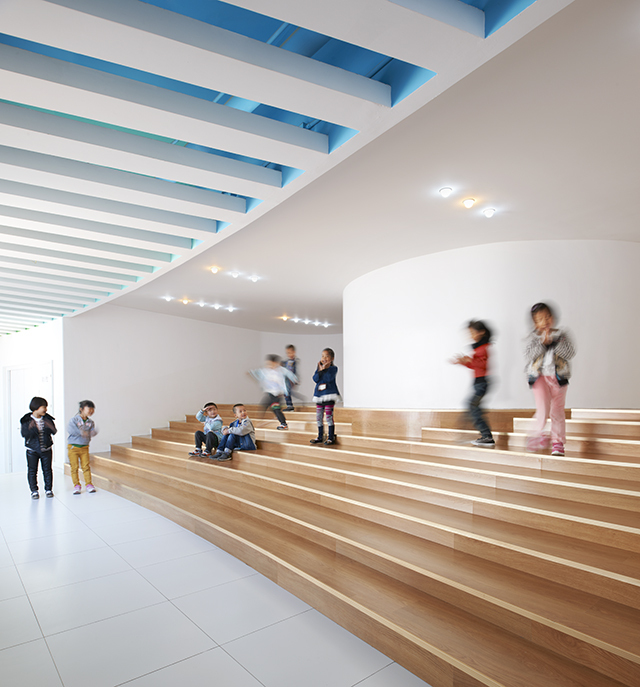 Children enter the school on wooden stairs that climb to the second floor, under the large blue arch of the building. Here, the kids are greeted with an outdoor courtyard (entering school at the playground? Sign us up!) with all of the classrooms facing towards it. This is is a wonderful space for children to play and enjoy the fresh air. With security in mind, Sako made sure that the layout provided that the whole courtyard would be in visible range for most adults. On the 3rd floor children can access to a balcony that leads to a roof top garden. Turf grass covers the roof top and is divided by large colorful walls, allowing for teachers to keep their students in proper sections. Under the outdoor courtyard there is an indoor courtyard for multi-purpose uses. This space has 3 rounded atrium's connecting to the outdoor space on upper level for better natural lighting and for creating a indoor playing space for children in bad weather conditions. The ceiling on each floor is in 18 different colors, with white louver boards under the ceiling. The color changing can been seen through the gaps between the louver boards when walking in the corridor. Also there are 18 different color columns in the courtyard, the children can use these colors to identify the location.